Thousands of Palestinians in the Gaza Strip remain homeless after their houses were badly damaged or destroyed during Israel's recent military offensive there. The Israeli army began with aerial bombardments of the enclave on 27 December and added a ground assault from 3 January. Israel declared a unilateral ceasefire on 18 January while Hamas, the de facto ruling authority in the Strip, declared its own ceasefire later that day. The NGO estimated that some 500,000 people, including 280,000 children, were forced from their homes at some point during the conflict and added that ‘tent cities’ had sprung up where whole neighbourhoods were destroyed. Many tent residents are without access to clean drinking water and toilets, it said. The tents are small and offer no protection from the low temperatures at night, which can reach below 7-8 degrees Celsius, according to Save the Children UK’s chief executive Jasmine Whitbread, speaking from Gaza on 16 February. She said that some camps of up to 40 families share one or two toilets between them, posing health risks. Most of the tents have been provided by the UN agency for Palestinian refugees (UNRWA), UNICEF and other international and local aid organisations. UNRWA said it had distributed emergency food parcels and non-food items, such as mattresses and blankets, to tens of thousands of Palestinians in Gaza who had been affected by the conflict. This was in addition to UNRWA's regular food distribution to 900,000 refugees in the Strip. According to UNRWA, tented communities have been set up in densely populated areas that came under fire by Israeli tanks. These are the northern areas of Jabalia and Beit Lahiya, the Zeitoun area in south Gaza City, Rafah on the southern border with Egypt and around Netzarim , a former Israeli settlement, where Israeli forces constructed a temporary military base during their operation. Hundreds of tents stand in the Abed Rabbo area of Jabalia. "Over the past two weeks we have distributed relief to 310 individuals who completely lost their homes and to 310 whose homes were damaged," said Fadi (he declined to give his family name), a volunteer with Islamic Foundation, a local NGO that supports Hamas, as he put emergency water and food supplies into packs in a tent. The parcels contained soap, potatoes, flour, milk and a protein supplement provided by the Hamas government. The Red Crescent delivered the water supplies and UNRWA the blankets and mattresses, Fadi said. "The Israeli troops bulldozed my home to enter the area with tanks," said Azza Abed Rabbo, 27, while clutching her four-year-old daughter, who she said sustained serious head wounds during the family's evacuation. "We have narrow streets; they [Israeli forces] were searching for tunnels beneath the homes." Thirty Abed Rabbo family members are sheltering in two tents. At least 4,000 homes were destroyed and about 17,000 badly damaged, according to a recent UN Gaza flash appeal, while 50,000 residents took shelter in UNRWA facilities during the height of the conflict and tens of thousands took refuge with family and friends. 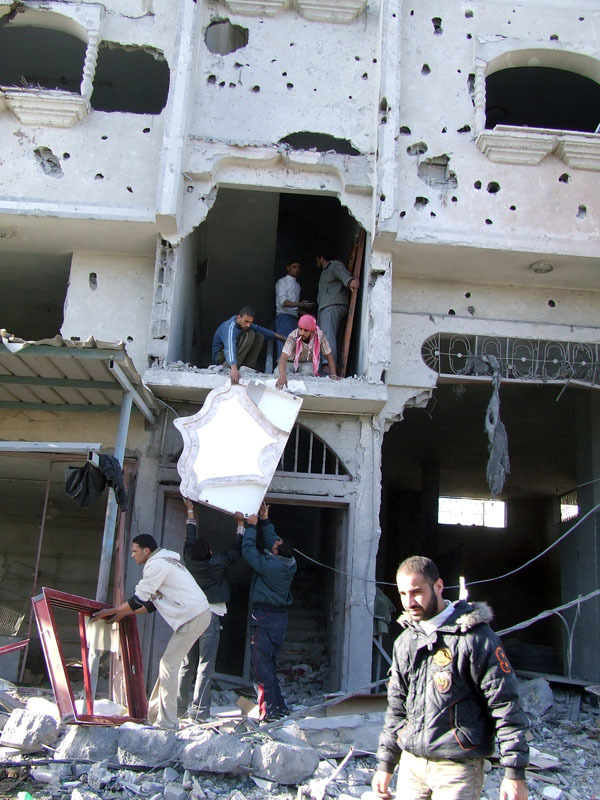 A UNDP-led survey of damaged and destroyed housing throughout Gaza conducted immediately following the ceasefire found the greatest destruction in the two northern governorates of North Gaza, where 1,436 houses were completely destroyed, and Gaza governorate, where 752 houses were completely destroyed. UNRWA estimates that an average of US$4,000 will be needed to repair each housing unit. As of 5 February, the Gaza health ministry said the Palestinian death toll from the three-week conflict had reached 1,440, including 431 children and 114 women. Some 5,380 were injured, including 1,872 children and 800 women, according to the ministry.